Meet "David Burns" from Fiddlerman's "Fiddle Talk" forum | LEARN TO PLAY THE VIOLIN FOR FREE! I played when I was younger, not very well, but I missed it. So I though I would take it up again. I have been playing since July I think. I have not picked up the violin in a couple weeks. I was playing everyday, several times a day. My practices sometimes lasted for several hours. I really have no proficiency on the violin, but that is ok with me, I am working on it! Just playing something recognizable, I am shooting for playing something beautiful, but I will take what I can get. Music expresses very pure emotions, I close my eyes when I hear a favorite song, (unless I am driving) and at times some very vivid imagery is produced. Music is tied to memory, some songs remind me of milestones in my life, good and bad. Some songs remind me of loved ones and friends who are no longer with us. Musically? I really never gave it any thought. I enjoy almost all music, even music in languages unfamiliar to me. I would like to play a song and have someone tell me it was beautiful. That will fulfill both goals. Suzuki method for 4 years, over 30 years ago. Play open strings and notes very slowly, play some very simple tunes like Twinkle Twinkle. I do like to stretch my shoulders, neck, forearms, wrists and fingers before playing. I really like the Theme from Shindler’s List. I really don’t know why, I have read numerous books about the Holocaust and the subject is beyond my understanding. How people could be so evil, and how people could survive such cruelty, and how some risked everything to save others simply humbles me. Believe it or not, I like to go to work, I love my job. I love to read, a wide range of subjects from humor to astronomy. My sister plays piano, my brother played trumpet, one son plays trombone and guitar, another plays trumpet. I play on my front porch, sometimes the public drives by. For a job? 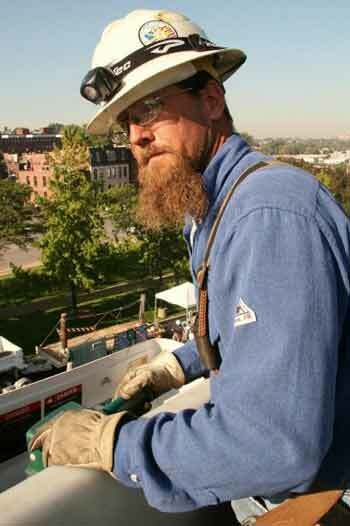 I am an electrical lineman, I build, maintain and repair powerlines. If you don’t mind, please share with us information about your violin and bow and if you have several please tell us about them as well. I have two violins, the first one I purchased online for $100 to see if I still had a drive to learn the violin. It seems I did have the drive and purchased a good student violin which cost quite a bit more. The first violin is a blue Cecilio and the new one is a natural finish, Helmke. Both are made in China.